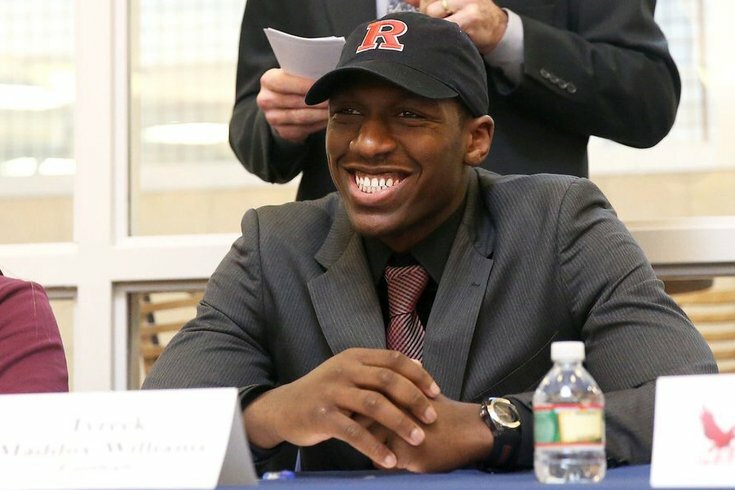 Timber Creek’s Tyreek Williams can't hide his enthusiasm after committing to Rutgers. Cary Angeline couldn’t wait to make it official. The 6-foot-7, 225-pound Downingtown East senior is considered one of the country’s best high school tight ends and he originally gave an oral commitment to USC. Then something happened. On October 12, 2015, Trojans’ coach Steve Sarkisian was fired, and the program seemed to be in great upheaval. USC even gave Angeline permission to begin talking again to other schools. A torrent of calls from every major college coach besieged Angeline—but he did something that he made official on Wednesday on National Signing Day and that’s to stay committed to USC. Angeline was one of hundreds elite high school football players across the nation that signed their official letter of intent. For many, like Angeline, it was a great relief. It’s the same feeling that Archbishop Wood’s Anthony Russo, Camden’s Ron Johnson and Timber Creek’s Tyreek Williams felt. • How are Temple and Penn State's recruiting classes looking? Click here. For Angeline, when USC retained coach Clay Helton, who was an assistant under Sarkisian, that eased the recruiting process. So was Russo, an Elite 11 selection and considered one of the top 17 high school senior quarterbacks in the country last summer. He led the Vikings to the PIAA Class AAA state championship as a junior and his stock rose considerably since then. Russo first committed to Rutgers, but when Scarlet Knights’ coach Kyle Flood and his staff were fired, he felt like looking around at other schools. He chose Temple. 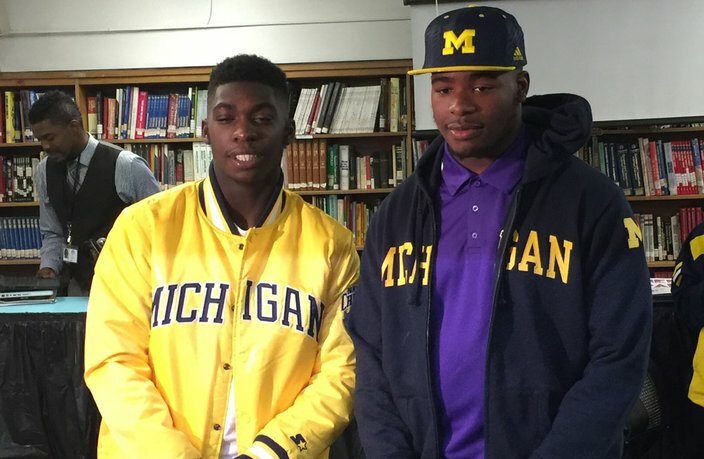 Camden teammates Brad Hawkins and Ron Johnson will be together again at Michigan. “I’m happy, but I’m happy that it’s over, too,” said the 6-4, 225-pound Russo. “I’m grateful for the opportunities that I’ve had throughout this process. I had a great relationship with coach Flood and it’s why I committed there. I didn’t feel as much of a bond with the new Rutgers coaching staff, and I had a month left in this process. Temple has been there since the beginning and they were one of the first schools to give me an offer. That meant a lot to me. It showed that they had the faith in me. Johnson’s recruiting road to Michigan was much smoother than what Angeline and Russo experienced. For one, he’ll be joining his teammate and friend, Brad Hawkins Camden a 6-1, 205-pound wide receiver, at Michigan. When he signed on Wednesday, it struck a visceral cord with Johnson and his family. He saw a little trickle in his dad’s eyes. It’s something that the Camden 6-4, 240-pound defensive end never saw before, when he signed his national letter of intent to sign and play for the Wolverines, after speaking with Michigan coach Jim Harbaugh Wednesday morning before making it official. Of the quartet, Williams, a 6-foot-1, 205-pound linebacker who signed with Rutgers, may have had the most interesting journey to National Signing Day. He didn’t play organized football until he was a sophomore, urged to give football a chance by Chargers’ coach Rob Hinson, who was his history teacher his freshman year. The youngest of three, his two older brothers are incarcerated and didn’t finish high school. For Williams, this was a chance to say, "you're welcome," for all that his family and coaches have done for him. “This is unbelievable,” Williams said. “I never imaged being in this position. The people around me, like my Uncle Hershell (Williams), imaged this. It was a little emotional, seeing my mom there and the kind of season that we had winning a state championship. Coming from a family where not everyone had the opportunity to go to college is very important to me. (Rutgers coach Chris) Ash recruited me and this means a lot to live up to what he expects of me. I expect to work hard and reach my full potential. I expect to contribute any way I can to the team. I think most of all this meant a lot for my mom. I’m playing for my brothers and for my Uncle Hershell, and I’m thankful for them all being in my life. I guess you can say the football scholarship is like a reward." Carlton Aiken Paulsboro QB 6-2/180 Central Ct. St.
Cameron Chambers Timber Creek WR 6-3/195 Michigan St.
Yasir Durant Imhotep Charter OL 6-5/340 San Diego St.
Craig Jones West Catholic DB 6-0/185 Central Ct. St.
Rashon Lusane Malvern Prep DB 6-1/190 Morgan St.